The idea for Morphology first emerged during a snowstorm in Minneapolis, MN. Morphology inventor and recent Macalester College graduate Kate Ryan Reiling and two of her friends were stranded in their apartment and decided to play a board game. They wanted to do something creative (and help their friend learn Spanish) so they opened a Spanish-English dictionary and built words using Jenga® blocks and Pente® pieces. Inspired by how much fun they had and how amazed she was at what they could build, Kate spent the next years prototyping what would soon become Morphology. When a Tuck professor wanted to purchase games to give out as gifts, Morphology Games was born. “I knew this was a once in a lifetime opportunity to follow that little voice in my head telling me that I had something special and it was worth chasing. Morphology Games launched in late fall of 2009, quickly selling out its original units and in 2010, went to the New York Toy Fair where it received two “Top New Toys of 2010” nods. In the fall of 2010, Morphology was selected as TIME’s Top Ten Toys list as the Number 2 Toy of the Year. We are a family that LOVES board games. 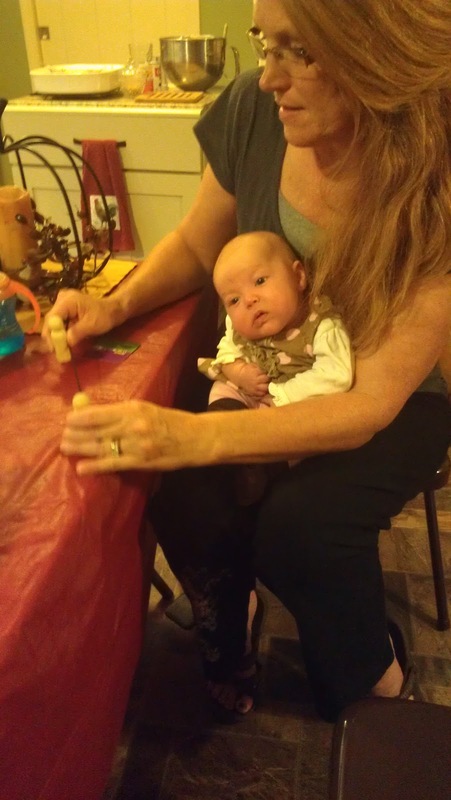 Even before we had kids my husband & I loved getting together with friends or family with a good board game. Now that our oldest is old enough to play we love them even more! 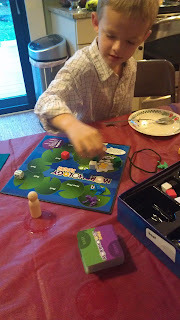 We were recently sent the new board game Morphology Jr. to try out. The game says for ages 8+ but we played it with our 4 1/2 year old, he loved it! We took the game over one Sunday afternoon to my parents house and we sat down with my parents and my brother to play. We had 3 on a team, making 2 teams. The only thing we needed to help our son with was reading the cards, my husband would take him aside to tell him the word he would be building and he took it from there. We were very impressed with how well he did in making his words come to life! This game was so much fun for our whole family! It took us just about 30-40 minutes to complete the game, so it is short enough where you wont loose the attention span of your kids. There is also a regular version of the game for kids ages 13+, so this could also make a fun family game for those of you with older kids. If you have kids that are below 13 and over, I would still go with the JR version, every card has an easy word and a hard word that will make this game fun for every age level! You can purchase this game online and at a few select stores. This would make a great Christmas gift for the game loving child in your family! One of you will win your choice of Morphology or Morphology Jr. Please fill out the form below for your chance to win! I will leave this giveaway open until Thurs. Nov. 15th. Good Luck!